Our unique and outstanding True Ofuro soaking bathtubs have been popular since we first designed and released these models. 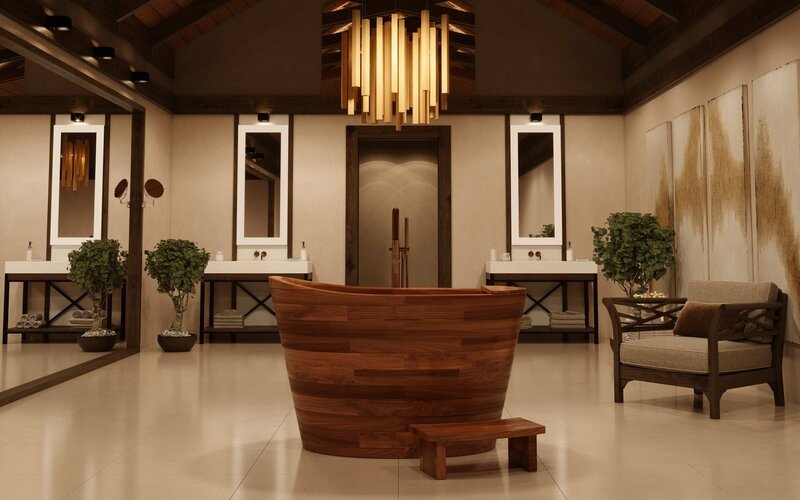 Inspired by the ancient bathing traditions of Japan, these baths reflect the age-old seated soaking style of bath that is made for pure relaxation and rejuvenation. Now we have taken the concept even closer to its heritage with the introduction of our superb American Walnut Ofuro bathtub. 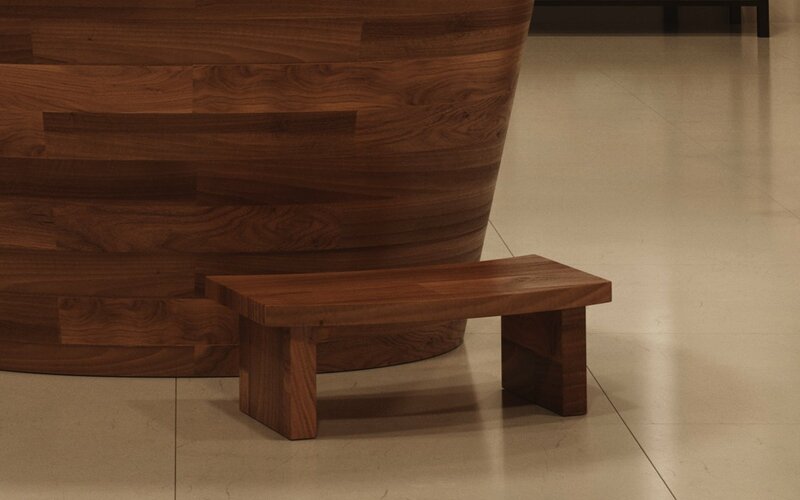 The result is a bathing masterpiece, combining the beautiful deep styling, seamless, sensuous dovetailed curves and warm, honeyed tones of 3.75” (97 mm) thick Walnut wood. This brings the real flavor of Japanese bathing into the modern era in a tub that cries craftsmanship of the highest order inspired by the artisans of yesteryear. However, the stunning, crafted rendition in timber takes this to a whole new level of excellence, with the silky smooth, ergonomic comfort and warmth of 100% natural, golden wood next to your skin. Imagine it ‘nesting’ in your bathroom. Of course, the compact footprint of this tub – ideal for bathrooms of all size. 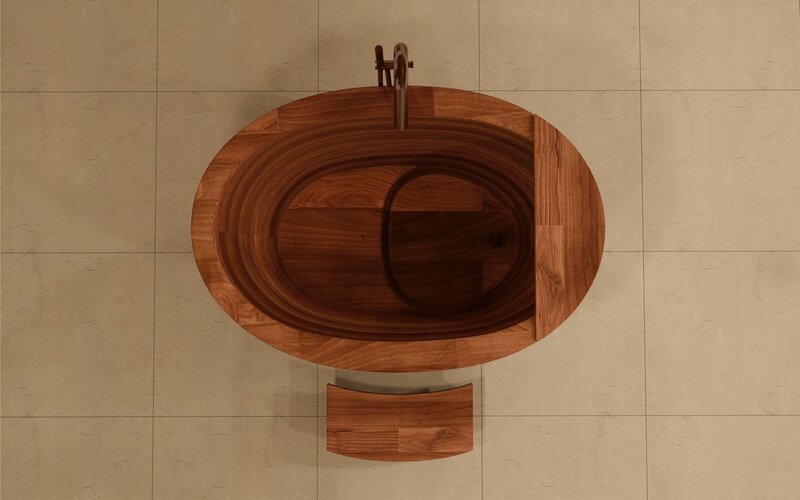 The design comes inclusive of its own matching solid walnut bath shelf, ideal to rest those personal bathing essentials. Our handy and very attractive matching tub step, also in matching solid, American walnut is very useful for shorter or older people as an aid to entering and exiting the tub. The Aquatica True Ofuro Japanese style bathtub comes standard with solid wood step and tray made of the same American walnut wood. 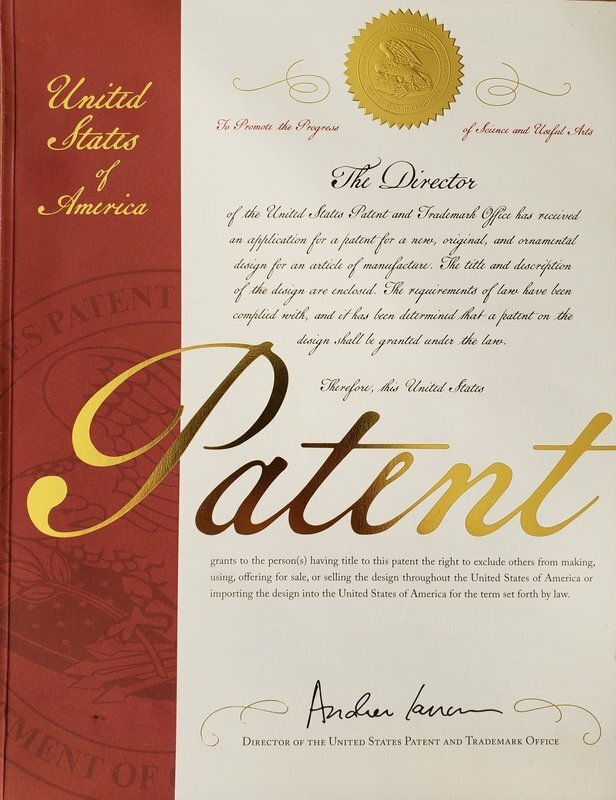 It is highly recommended for older people or those shorter than 5'1” (155 cm). 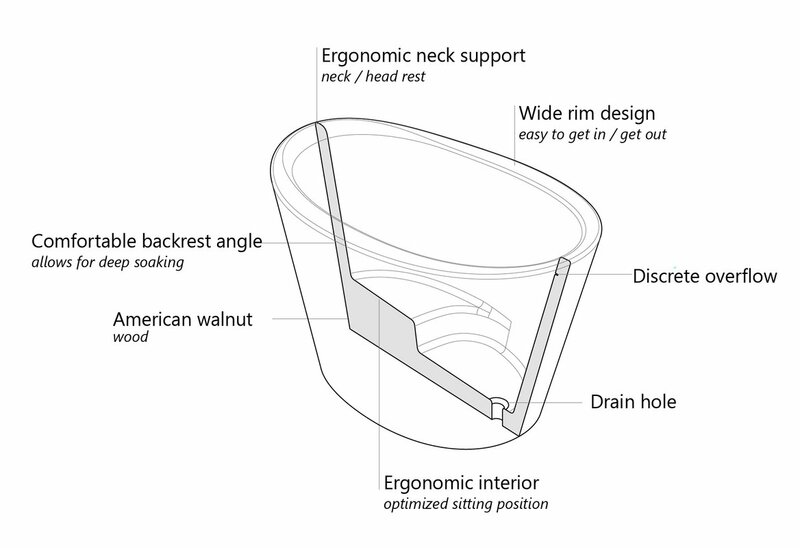 Aquatica True Ofuro features wide rim, designed to ease the process of getting in and out of the bathtub. 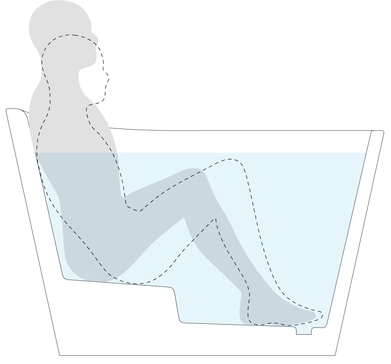 The wide and rounded rim allows for shorter, older and physically less fit people to sit or lean safely on the bath rim while getting in and out of the Ofuro. The origins of the Ofuro tub lie in hand-crafted artisanship. 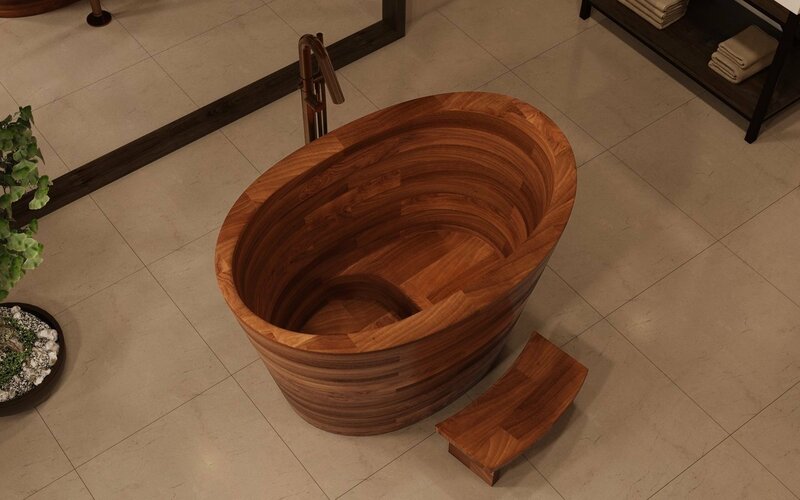 Aquatica has translated this into a stunning, solid American walnut bathtub that is warm and tactile, with its own organic oil which keeps it waterproof and prevents water damage and cracking. The rich dark wood tones and smooth finish of the wood add a natural earthy touch to your bathroom. American Walnut is highly prized as a dense, solid wood that combines natural beauty with resistance to denting and wear. 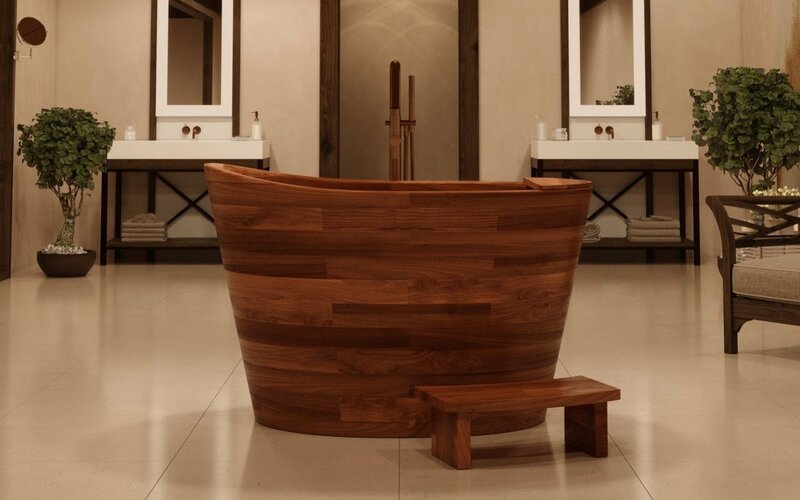 As such it is regarded as the ideal medium for furniture and such as our Ofuro bath. It is also sort after for it natural rich tones and lustrous patterned grain. It requires no artificial staining as its original look is simply beautiful. Nor do its looks change over time. 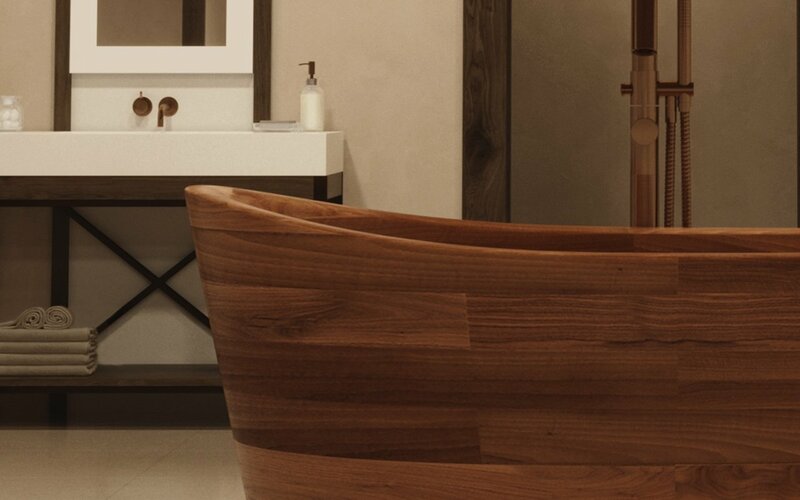 Its robust durability means your Walnut bath will retain its good looks, which as with quality natural wood products, acquire additional beauty and the patina through use and time. 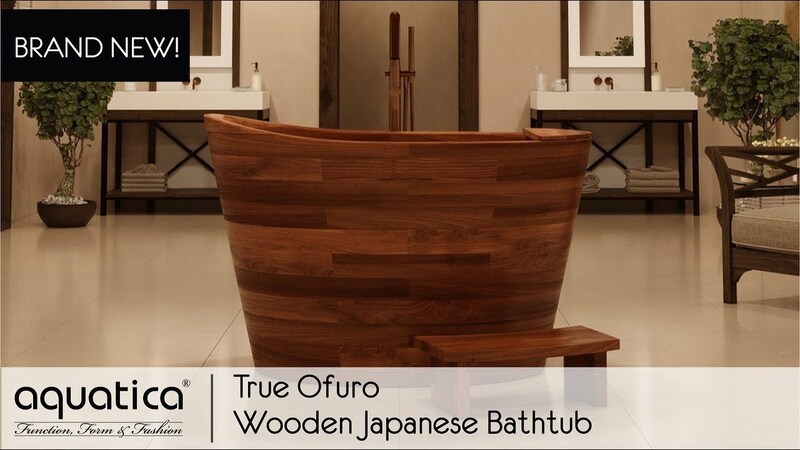 One of the most attractive features of the Aquatica True Ofuro Wooden Freestanding Japanese Soaking Bathtub is that you can choose from a variety of wooden materials. For a natural look, select any of the six warm natural wood species. Maybe it's the smart, the contemporary look of the marple or ash, or sophisticated walnut or padouk you are looking for. 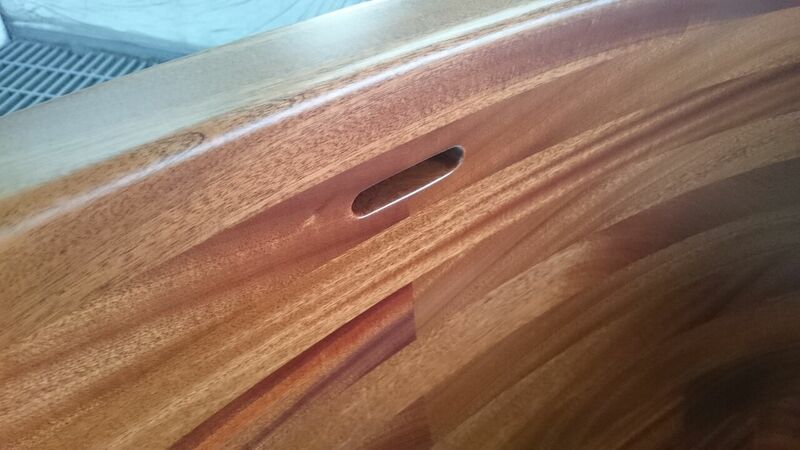 Perhaps you prefer the rich golden timber hues of oak or sapele.